Cable Casting: Brad Pitt Out, Russell Crowe on the List for Deadpool 2? Cable casting is still underway for Deadpool 2 and now ComicBook.com has confirmed with director David Leitch that the list has one less actor: Brad Pitt. The superstar surfaced on the web in leaked production art depicting Pitt in a cybernetically-enhanced Cable body, but apparently the cool-looking art wasn’t enough to convince him to take on the Merc with a Mouth. 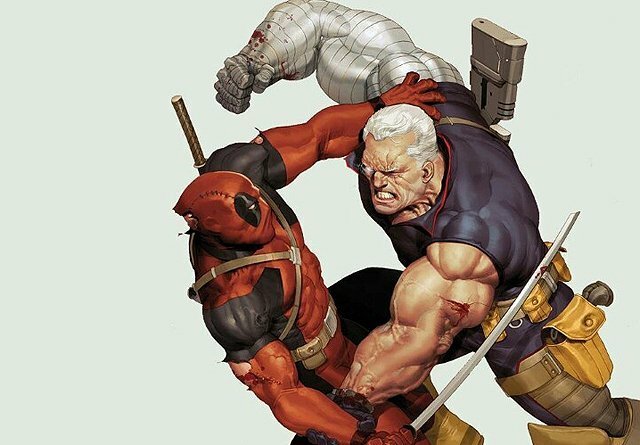 RELATED: Deadpool 2 Writers Talk Cable and More! With Pitt out of the picture, it clears the way for General Zod himself, Michael Shannon (Man of Steel, Midnight Special), as the frontrunner, as was previously reported. There are still several others on the Cable casting shortlist, including Stranger Things actor David Harbour and, reportedly, Russell Crowe (Gladiator, The Nice Guys). Crowe himself reached out to Deadpool creator Rob Liefeld on Twitter last month after fan art was posted depicting him as Nathan Summers. Leitch also recently told Empire that he plans to up the action quotient for Deadpool 2, which is not surprising given his background in action choreography, though he won’t skimp on the comedy either. Deadpool 2 is set to introduce two key characters from the X-Force world, including Zazie Beetz (Atlanta) as Domino, a luck-manipulating mutant, and Cable, the time-traveling son of the X-Men’s Cyclops. It’s also been confirmed that both an X-Force movie and a Deadpool 3 are being planned as separate follow-ups to Deadpool 2. John Wick‘s David Leitch is directing Deadpool 2 from a screenplay by the returning “real heroes here,” screenwriters Reese and Paul Wernick. Reynolds is again serving as a producer on Deadpool 2 alongside X-Men franchise caretakers Simon Kinberg and Lauren Shuler Donner. What’s the best Cable casting decision the filmmakers could make? Let us know in the comments below!